After many years of continuously improving the treat stick concept, we are proud to offer what we believe to be the best treat on the market. 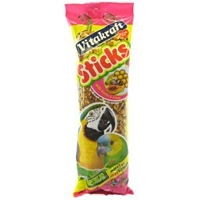 Every Vitakraft treat stick has a wooden core which is dipped in a calcium and mineral rich “batter”, coated with seeds and grains and then baked. This process is repeated at least three times. The result is a very long lasting, triple baked treat that is as nutritious as it is fun for your pet. When the seed is all gone, the small animals enjoy nibbling on the wooden core as well.